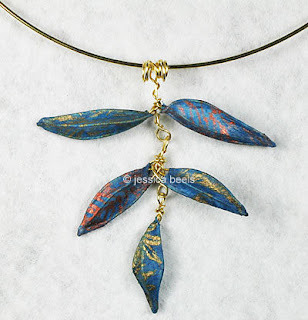 Recently I came across this beautiful handmade paper pendant and knew immediately that I wanted to feature its designer, artist Jessica Beels of Washington, D.C.
Jessica uses overbeaten flax and mulberry fiber to make the paper for her jewelry and sculpture pieces. She often prints the wet paper with paints and inks; it acquires a unique shape as it dries and shrinks over a reed or wire form. 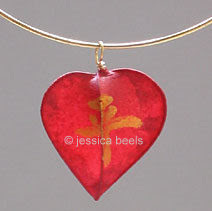 This is one of her newest pieces - Blossom Flower Necklace. The interesting color gradation is achieved by using an ungalvanized steel form over which the paper dries, creating rust. The piece is then sealed with wax which enhances its translucence. 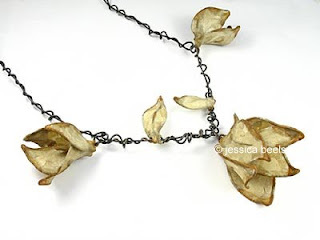 In addition to paper, Jessica makes innovative sculptural beadwork jewelry and also works with felt, epoxy, and precious metal clay. You can see many more examples of her designs at her website, and also a show schedule. Jessica will be featuring her handmade paper sculpture and jewelry at the Smithsonian Craft Show in Washington, D.C., April 22-25.